Recovery for Outlook Express 1.2.0845 free download. Recovery for Outlook Express is a useful utility that fixes corrupted Microsoft Outlook Express folders. Unfortunately, corrupted file systems pop up and damage important folders at the worst possible times. When this happens, Recovery for Outlook Express can save the day. Recovery for Outlook Express is easy to set up and easy to access. Supports corrupted folders recovery from Microsoft Outlook Express versions 4, 5, 5.5 and 6. Recovers messages in both plain text and HTML-format. Recovery for Outlook Express recovers message fields such as sender's and recipient's names and emails, subject, message flags, creation date/time, etc. Supports file attachments recovery. Available for all modern platforms including Windows 95/98/NT/2/ME/XP. 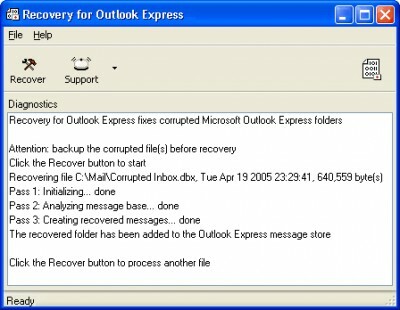 OutlookExpressRecovery fixes corrupted Microsoft Outlook Express folders. Quick Recovery Microsoft Express (DBX-MBX) is a non-destructive, simple and easy to use data recovery software, supports all types of media viz. Quick Recovery for Mails is a do-it-yourself non-destructive mail recovery software. Disk Doctor's Email Recovery (DBX) is a tool designed for recovering accidentally deleted Outlook Express messages from any "dbx / mbx" archive or to repair damaged *.